Fishermen are at work aboard the herring lugger. The ship's cook serves the men beans after work. This food isn't appreciated. The ship's cooks of the herring luggers receive instruction from a teacher in the practical training room of the domestic science school in The Hague. 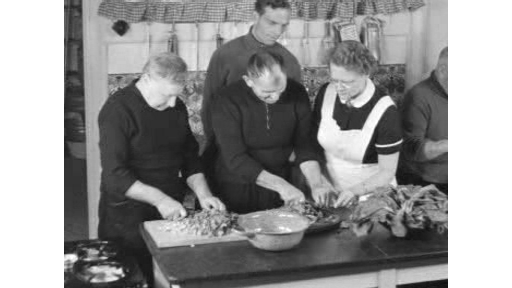 They learn how to cook varied meals, cooked according to the latest standards in healthy eating, in stead of serving the men beans. The men learn to bake bread and make fresh soup.